Surveying the traders at SMB, Bella recently reported that the number one problem they had during the past year was forcing trades. That is, they failed to wait for trades to properly set up and instead tried to front-run the patterns they were trading. Bella then offered three ideas for traders looking to improve their patience and reduce their forcing of trades. Those ideas include journaling, studying your "Playbook" of best trades, and taking breaks to speak with other traders. Note how all of these strategies involve getting one's nose out of the screen, stepping back, and gaining perspective. 1) A situation occurs that the trader personalizes in some manner. The market moves and the trader blames himself/herself for missing the move. Or the trader is stopped out and is concerned about taking a loss. The situation gets the trader P/L focused and self-focused and no longer market focused. This is very important. Psychological problems in trading typically begin with a shift of focus and a loss of market focus. 2) The personalizing of the situation leads to an emotional reaction. Generally that reaction is one of frustration, fear, or overeagerness/overconfidence. That emotional reaction represents the body's fight or flight response to a perceived emergency and leads us to act rather than stay patient. Once we personalize a situation, it's no longer about the trade. 3) The emotional reaction leads to reactive decision-making. Out of frustration or fear, we take trades we shouldn't, abandon good trades, etc. Many times, when we review the situation after the market close, we wonder how we could have been so foolish. The trading decision was not made for trading reasons; it was made to manage the crisis that we had talked ourselves into. Once we understand this three-step sequence, we can become more aware of our own patterns and disrupt them before they lead to poor decisions and actions. For example, I know in my own trading that once I'm thinking about myself, my track record, my P/L on the day, I'm not in the zone. At that point, the focus needs to shift from the market to my own processing of events. By taking deep breaths, slowing myself down, placing the situation in perspective, and returning to the market with fresh eyes on opportunity, I prevent the initial problem from cascading. Very often, we recognize our problem patterns by identifying signature negative thoughts and/or feelings: ones that recur in market situations. It's almost as if a script is playing itself in our heads. 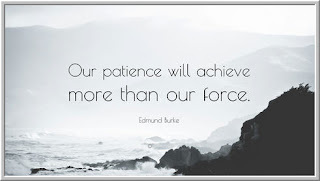 When we view the script as the problem, not the market, we not only open ourselves to patience; we also create a situation where we can use our patient time to reinforce new and constructive ways of processing market outcomes.